Rabbits aren't your everyday house pet, but they're enjoyable little animals who make interesting companions. With some effort rabbits can be litter box trained to put your mind at ease when allowing them to hop freely about the house. It's never a wise move, however, to allow your rabbit total unsupervised freedom inside your home. After all, bunnies are nibblers and you don't want yours chewing on unsafe items like plastic. If you haven't already noticed, one of your bunny's favorite hobbies is chewing. He'll chew almost anything he gets his paws on, and that includes items left in his path that are made of plastic. He'll happily chomp on soft plastic like plastic wrap, flexible plastic like aquarium tubing -- he'll even try chewing the hard plastic controller for your video game if you give him the chance. Your bunny's gnawing impulses are perfectly normal. They give him something to do and keep his teeth worn down, a practice that is necessary to keep them from growing so long that they no longer fit together properly. This condition is known as malocclusion. It's painful for your rabbit and will make it hard for him to eat. When your bunny chews on plastic it not only ruins the item, it can harm him physically as well if he swallows the bits of plastic he nibbles. Even if a piece of plastic is small enough for your rabbit to swallow without choking, it can be too big to move through his digestive tract. This can end up causing an obstruction, irritation and pain. If you suspect your bunny has eaten pieces of plastic and he's showing signs like constipation, stomach pain and loss of appetite, get him to the vet immediately. The doctor will have to X-ray your bun to confirm an obstruction and will end up operating to clear the problem up and remove any tissue that has been damaged. Considering rabbits' fondness for chewing anything that can be chewed and even some things that can't, the number of rabbit items that are made from plastic is amazing. Many articles from hopper-style feeders to cages are made from brightly colored plastic. While these things look attractive on the pet supply shelf, putting them to use is another story. If you choose to house your bunny in a plastic cage with plastic dinnerware and other accessories, you'll find yourself replacing items often and at some point will come home to find a bunny cage with one or more holes in it. Providing your rabbit with toys will keep him busy and prevent boredom. 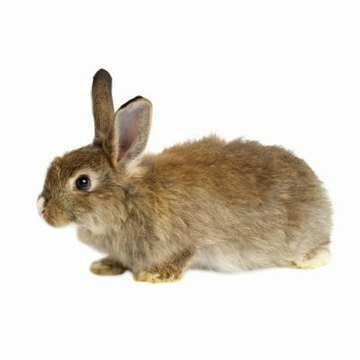 There are a number of toys you can buy at the pet supply that are made specifically for rabbits and you'll find that some are even made of solid, hard plastic. These are more appropriate for a bunny than plastic ones that can easily be broken. If you want to steer entirely clear of plastic, give him a wicker basket that hasn't been treated or painted and fill it with junk mail, straw or an old phone book. Thoroughly wash and dry some pinecones or give him untreated blocks of wood -- although avoid apricot, cherry, peach, plum and redwood as they are toxic to rabbits. Rabbits also love shredding cardboard from a box or a paper towel or toilet paper roll. Rabbits - From the Animal's Point of View; M. Smith, et al.